(CNN) -- Germany's Jewish community Tuesday welcomed the deportation from the U.S. of a Nazi war crimes suspect who is charged with being an accessory to the murder of about 29,000 civilians at a death camp. 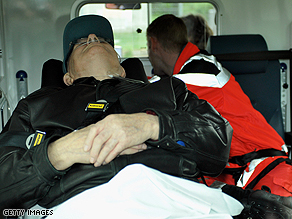 Deported war crimes suspect John Demjanjuk is transported in an ambulance after his arrival in Germany. Charlotte Knobloch, president of the Central Council of Jews, said the arrival of John Demjanjuk was a warning to other World War II-era criminals. Demjanjuk was taken by ambulance to a nearby hospital after landing at Munich airport. An ambulance was also used to take the 89-year-old to a plane at airport in Cleveland, Ohio on Monday evening. Demjanjuk, a native Ukranian who has long claimed he was a prisoner of war rather than a death camp guard, is wanted in Germany for his alleged role in the murder of about 29,000 civilians at Sobibor, a Nazi death camp in Poland. "All the living Nazi war criminals should know that there can be no mercy for them, regardless of their age," Knobloch said in a statement. "They must be held accountable for their inhumane actions. Because there is no statute of limitations for crimes against humanity." The U.S. Supreme Court last Thursday denied a stay of deportation for Demjanjuk. Justice John Paul Stevens without comment refused to intervene in the planned transfer from the United States. Federal courts rejected his appeals, and the order from Stevens cleared the way for the Justice Department to move ahead with the deportation. Demjanjuk's lawyers had asked the high court to consider their claims that he was too ill and frail to be sent overseas. They also raised human rights and other legal issues in their last-minute appeal. A German court last Wednesday had also ruled against a request for a stay. Officials in Berlin have issued an arrest warrant charging Demjanjuk with being an accessory to the murders of about 29,000 civilians at Sobibor in 1943. U.S. immigration officers previously entered Demjanjuk's Cleveland-area home on April 14, and carried him out in his wheelchair to a waiting van. He was held for a few hours and then returned to his residence after a federal appeals court ruled temporarily in his favor. CNN's Terry Frieden and Bill Mears contributed to this report.